HERO is a puzzlescript game created by Yours Truly. Your only controls in Hero are the arrow keys. If you are hit twice, you will die. Collect a shield to absorb an additional hit. Watch out for spike pits. You can push certain items like tables, menhirs and keys. Rescue folks lost in the dungeon. Some monsters are harmless, some will damage you only if they attack first, some will damage you regardless. Spike Pit -fall into this and take damage! Chasm -fall into this and die instantly! Click on image to go to game, *then* click on the game window and press X to start. 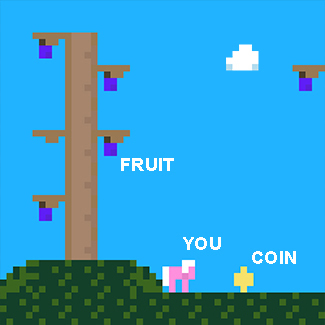 Eat fruit and gather coins as Princess Mega-Pony!! Don't forget to climb the trees.